For Q1 2018, we’ve analyzed over 300 million Twitter ad impressions and more than 8 million clicks. Compared to Q4 ’17, we found the median CPM for Twitter placement ads increased by 7.6%, the median CPC for Twitter ads increased by 6.1%, and the median CTR for Twitter ads decreased by 8.9%. Our data, gathered from marketers on the AdStage platform, show an increase in CPMs for the second quarter in a row. Median CPMs are up 7.6% Q/Q, ending at $6.46 in Q1 2018. 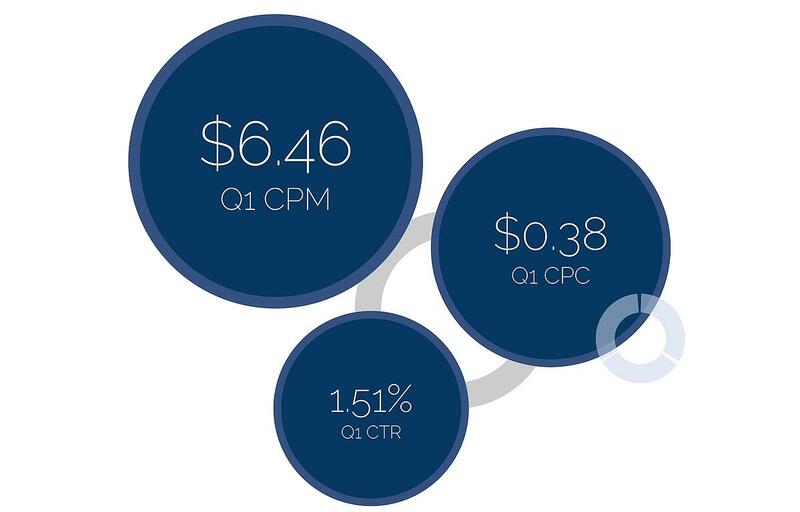 The median CPM has increased $1.26 over Q1 last year. CPCs for Twitter ads increased for the second quarter after a drop in Q3 2017, ending the Q1 2018 at a median CPC of $0.38. Costs continue to well below 2017 highs, down 35% Y/Y. Our data analysis shows that median CTRs on Twitter ads increased by 72% Y/Y, although it’s slightly down from a high in Q4. Among the marketers we studied, median CTR dropped 8.9% Q/Q, ending the quarter at 1.51%. The data we analyzed from marketers on the AdStage Platform is a snapshot of the overall paid performance data. While you may experience similar performance metrics as our data show, it’s important to understand the overall trends and changes that can affect your unique campaigns. Twitter set high expectations among advertisers in Q4, and has continued to deliver confidence that ads produce results on the platform. People are spending more time on Twitter as a result of a focus on video and an algorithm change that surfaces relevant content first, according to Richard Greenfield, an analyst at BTIG. This trend is a welcome change of pace from past performance. As US user growth flattens, watch for user growth outside the US, providing new audiences for advertisers. Twitter has continued to increase its Japanese user base, up over 12% Y/Y going into 2018, and is expected to continue its push into new markets. “We do believe a renaissance of growth and new engagement is starting to benefit Twitter,” Daniel Ives, head of technology research at GBH, stated in a recent CNBC article. It’s well worth the effort and budget to continue advertising on Twitter, given its new push into video and expanded reach into new markets.